Eli Lilly has asked for and obtained an injunction against mental health rights advocate Jim Gottstein saying he may not distribute documents obtained by subpoena from the records of a previous court case. The internal documents detail the drug maker's efforts to cover up its knowledge of serious side effects of anti depressant Zyprexa and to instruct sales people to market the drug for uses that it had not been approved for by the FDA. The decision of judge Jack Weinstein (PDF) bars Gottstein from further distributing the documents, but the the cat is already out of the bag. In "Leaked Documents, the Web, and Prior Restraint", Amy Gahran describes how efforts to round up the documents and put the "secret" stamp back on them will essentially be useless. The case is highlighting a serious problem in our society: lack of transparency. In this case, documents that show reprehensible if not criminal conduct by Eli Lilly were part of a court case, but the settlement made between the drug maker and the people who had been harmed by Zyprexa included a clause that sealed the documents in perpetuity. This is a rather common practice. Drug companies are sued, the cases are settled, the documents sealed, and business continues as usual. Lilly's suppression of its own evidence has been called "reckless and threatening to women's health and life" by Dr Samuel Epstein, MD, Chairman of the Cancer Prevention Coalition, according to an article by Evelyn Pringle: Eli Lilly The Habitual Offender. While there is no chance to make the leak undone, Lilly sems to be on a punitive expedition now. The company apparently wants to "make an example" of Jim Gottstein who says the drug maker is likely to seek "financially ruinous contempt sanctions" or even go for criminal contempt of court. That would discourage future leaks, seems to be the calculation, but I am not so sure that the math is correct. If there is any trend visible at all, it is for more transparency, not less. At least that seems to be the case when we look at a new website that is soon to come on line and is slated to provide a safe place for all kinds of leaked documents: WikiLeaks. Whistleblowers, people in government posts who publish government wrongdoing have long have protection against being dismissed or demoted, but this kind of protection has recently been much reduced or disregarded. But perhaps the anonymity afforded by the net will overcome these difficulties. U.S. District Court Judge Jack B. Weinstein issued a permanent injunction today, barring mental health rights advocate and attorney Jim Gottstein, and expert witness Dr. David Egilman, from further distributing internal Eli Lilly documents concerning the drug Zyprexa. The documents were recently reported in the New York Times to contain evidence that Lilly downplayed the risks of Zyprexa, its best-selling drug, and trained its sales force to encourage doctors to prescribe the drug for non-FDA approved uses. Last December, Gottstein, who is President and CEO of The Law Project for Psychiatric Rights, Inc. (PsychRights) subpoenaed internal Eli Lilly documents for a case involving forced drugging of a client. The documents were under a protective order as part of a massive products liability case, but the protective order also provided the steps by which the documents might be subpoenaed. Believing he had obtained the documents legally, and because of the importance of the information to patients, doctors, and the general public, Gottstein released the documents to the New York Times and others. Zyprexa is big business for Lilly: last year’s sales of the drug amounted to $4.4 billion. Lilly sought and obtained an injunction against Gottstein and others to whom he had sent the documents--which Lilly claims contain "trade secrets"-- prohibiting them from disseminating the internal company files. By that time, however, the New York Times had begun publishing stories on the files. Soon thereafter, various versions of the files appeared on the Internet. "This was not a conspiracy to harm Eli Lilly." says Gottstein. "The Court’s order sealing the documents provided for release of the documents in circumstances like these, and I made a concerted good faith effort to follow those provisions to the letter. If anyone truly intended to violate the sealing order, there would have been no reason to even subpoena the documents." Judge Weinstein saw it differently, outlining other means in the sealing order by which the documents might have been obtained and choosing to continue the injunction against Gottstein. While the injunction also covers others who received the documents directly from Gottstein, but still have not returned them, Judge Weinstein refused to honor Lilly’s request to continue the injunction against various websites that had posted the documents, nor were the New York Times, or other news organizations who have the documents, named in the injunction. In fact, as Judge Weinstein pointed out in today’s order, "There has already been sufficient revelation in the New York Times so that if Congress, the Food and Drug Administration, or the Federal Trade Commission wish to investigate or act they have grounds for doing so, subpoenaing protected documents as necessary for their purposes." The most important issue, says Gottstein, is the right of patients and the public to know the truth about Zyprexa. "Zyprexa has killed and permanently sickened thousands of people who have taken it. The files show that the manufacturer hid vital information about the drug’s safety not only from patients, but also from doctors. The bottom line is patient safety." He continued, "Did I want to get this information in front of the public and the medical profession? Of course. Additional lives may well have been saved." Judge Weinstein’s decision, the New York Times articles, and other background information on the case is available on the PsychRights website at http://psychrights.org. 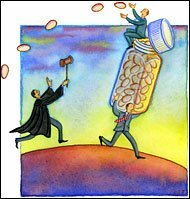 The Law Project for Psychiatric Rights is a public interest law firm devoted to the defense of people facing unwarranted forced psychiatric drugging and other forced psychiatric interventions. PsychRights is further dedicated to exposing the truth about these treatments and that the courts are being misled into ordering people to be subjected to damaging drugs against their will. Extensive information about this is available on the PsychRights web site: http://psychrights.org/. Jack B. Weinstein, age 85, has, for more than a quarter of a century as chief judge for the Eastern District of New York, supported an independent judiciary. He has single-handedly virtually written the book on large scale personal injury and mass tort litigation. He has worked with both chemical manufacturers and Agent Orange plaintiffs which were clogging the court system and pressured both sides to establish a $180 million fund for the veterans taking part in this class action, which served to unclog the court calendars. He also worked with the backlog of asbestos injury cases to consolidate them. While these procedures do move cases along, in 1992, he told the Wall Street Journal that the present system that he created does not always meet peoples' needs, and that many people caught up in mass tort cases feel "alienated and dehumanized." Judge Weinstein has always tended to avoid harsh criminal sentences. In previous cases, according to archival reports from the New York Times, Judge Weinstein has set award limits based upon statistical guidelines for pain and suffering around what he considered "reasonable compensation." In the past, he dismissed a suit brought by the NAACP against the gun industry and has also dismissed lawsuits against chemical companies by veterans of the Viet Nam War who claimed that exposure to the defoliant Agent Orange had given them cancer. He also dismissed a case filed on behalf of millions of Vietnamese who claimed that American chemical companies supplied the U.S. military with the defoliant Agent Orange and hence committed war crimes. Judge Weinstein's style of aggressive determination in the court system has often left him open to attack and to many reversals of his decisions. Sheila L. Birnbaum, an attorney who frequently appeared in his court said, "He often reached what he believed to be the right result and then reached past the law to get there." This activist tendency has earned him the nickname "Reversible Jack." Recently, Judge Weinstein was involved with the settlement of a case against Eli Lilly Pharmaceutical Company in which sealed documents were released to the press which implicates the company in hiding its own research which clearly showed major health risks from Zyprexa, the world's top selling psychiatric drug with sales of $4.2 billion last year alone. The materials appear to show that Eli Lilly has engaged in massive public relations and marketing efforts to play down the health risks of Zyprexa, and this is apparently supported by hundreds of documents and e-mails from top company officials. The health risks include but are not limited to diabetes, obesity, sharp rises in blood sugar, not to mention the risk of tardive dyskinesia and akathesia. As a result of these disclosures, seven states are currently suing Eli Lilly for unlawful kickbacks to physicians to generate sales and improper promotion of the drug in nursing homes as a sedative so they could maximize their profits. There are also probes in various states regarding off-label marketing and other states are even contemplating the possibility of criminal charges against the drug company officials. It is estimated that more than 3,500 people have died and many more have become seriously ill as a result of the diseases created by this drug, more than the total American deaths due to the war in Iraq. Coincidentally, Eli Lilly is also the largest producer of diabetic medications and insulin in the United States. Sweet! When the internal Eli Lilly documents were exposed to the public, Judge Weinstein focused aggressively on psychiatric rights lawyer Jim Gottstein. The question many of us have is why, considering his leniency with others? Q. Why is judge Weinstein imposing such a harsh attack upon a public interest lawyer who obviously makes no money in this situation and is obviously trying to save the lives of psychiatric patients? A. The judge's main focus appears to be the personal preservation of his tort reform procedures which involve speeding up the court process with quick resolution of cases. Jim Gottstein's dissemination of these materials, because the information is both life saving for many, and also shows criminal behavior on the part of the drug company executives, raises questions about the efficacy of settling cases like this around non-disclosure agreements when they jeopardize public safety and hide blatant criminality. The judge, probably an honorable man, sees his procedural legacy as the most significant aspect of this case, and Gottstein's actions have threatened his legacy. Q. What is Eli Lilly's role in this case? A. The company executives are apparently trying to hide criminal behavior on the part of their own executives by trying to stuff all the beans back in the bag even though the whole world has already seen them. Q. What is the error in the Judge's ruling? A. When a lawsuit is settled and an agreement is reached between both parties that all documents should be sealed, (non-disclosure agreement), under ordinary circumstances, that should be acceptable. However, if the documents reveal criminal behavior or behavior that resulted in a massive public health problem, it is not in the public interest to allow such documents to be kept secret. To sanction this is an abuse of the legal system. When a judge becomes so blinded by his own personal issues (Tort Reform) as to sanction this abuse of the legal system, in all honesty, he must recuse himself. Mr Gottstein argues that the public has a right to know the truth about the risks associated with the drug. "The files show that the manufacturer hid vital information about the drug's safety," he states, "not only from patients, but also from doctors." - "Zyprexa has killed and permanently sickened thousands of people who have taken it," he says. Mr Gottstein openly admits that he wanted to get the information out to save lives. "The bottom line is patient safety," he said. Washington "under the Pharma Lilly"
We are urging all consumers of prescription medications to boycott Eli Lilly Pharmaceutical Company. If you are taking one of their medications, call your physician and ask to be switched over to a similar drug produced by another company. Don't let this drug company get away with the murder of any more people so they can maintain their market share. Eli Lilly Pharmaceuticals is the most aggressive marketer of drugs in the world and the world's largest producer of psychiatric drugs. They are presently being sued by at least seven states (that figure is rising daily) for improperly promoting the neuroleptic drug ZYPREXA to nursing homes and physicians for "off-label�?? use as a sedative. They are charged with "unlawful payment of kickbacks to physicians in order to continue generating sales of ZYPREXA,�?? and "unlawfully marketing the drug.�?? By marketing this drug the way they did, prescriptions for it seriously depleted Medicaid funds in most states. The company's reaction to these disclosures was to get an injunction against the lawyer who exposed the information, claiming that the documents contain "trade secrets.�?? Under federal law, physicians can prescribe drugs for uses that aren't approved by the U.S. Food and Drug Administration, but pharmaceutical companies cannot market their drugs for those "off-Label�?? uses. Federal probes of Eli Lilly are also beginning by the House Oversight and Government Reform Committee. However, since the pharmaceutical companies are major contributors to almost all of their reelection campaigns, it is doubtful that much will be done in that venue to protect the public. The FDA, which is seen by most people as nothing more than an arm of the pharmaceutical industry, has done nothing. WE ARE THEREFORE CALLING ON EVERYONE TO ACT IN THEIR OWN BEST INTERESTS AND PUNISH ANY DRUG COMPANY THAT KNOWINGLY PUTS OUT A DRUG THAT HURTS US OR WORSE, KILLS US. BOYCOTT ELI LILLY PRODUCTS!